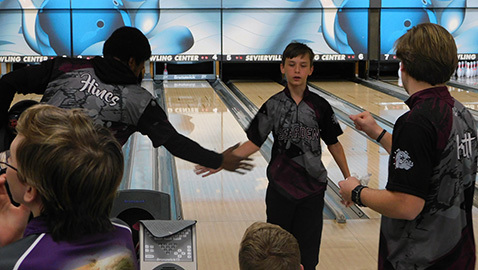 It wasn’t a perfect day, but the Bearden High boys bowling team added two more first-time accomplishments to its banner season. The Bulldogs defeated Gatlinburg-Pittman 18-9 in the Region 2 tournament semifinals Thursday at the Sevierville Bowling Center to earn their first region title berth and automatically qualify for their first TSSAA sectional. Host Sevier County, however, handed Bearden its first loss in the region championship match, defeating the Bulldogs 20-7. The Smoky Bears had reached the finals with a 20-7 win over Knoxville Catholic. Bearden (20-1) will go against Region 1 champion Greeneville in the sectionals today (Jan. 14) at 2 o’clock on the Greene Devils’ home lanes. Cherokee High, the Region 1 runner-up, will bowl at Sevier County (17-1). Sectional winners will advance to the state tournament, which starts Thursday at Smyrna. A trip to the state, of course, would be another first for Coach Jennifer Allen’s Bulldogs. Bearden’s girls team was closing in on a region title berth before William Blount rallied past the Lady Bulldogs 14-13 in their semifinal matchup. Sevier County rolled past South-Doyle 22½ to 4½ in the other semifinal contest and then toppled William Blount 20-7 in the finals to make it a region sweep. The Sevier County girls were scheduled to host Dobyns-Bennett in this past Saturday’s sectional, while William Blount traveled to Cherokee. Bearden’s boys split the six individual matches in Game 1 of its title matchup with Sevier County, but Coach Dixon Brown’s Smoky Bears pulled away in the last two games and finished with a 3,204 total pin fall. Dustin Linnert led Sevier County with games of 242, 162 and 237. Bearden’s Ben Whitaker swept his three matches with games of 207, 221 and 186. “We bowled really well against Gatlinburg-Pittman,” said Bearden senior Corey Ramey. “All of our players bowled consistently and everyone did phenomenal. Bearden defeated its upcoming sectional opponent in the regular season at a neutral site. “If we come out consistent, I’m pretty sure we can win,” said Ramey, already an individual state qualifier. “The goal is to get all of us to the state. Megan Hickman swept all three of her matches in the No. 4 lineup position with games of 246, 179 and 168 to lead the unbeaten Sevier County girls to their 15th victory. In semifinal action, Whitaker swept three matches with a 691 series (242, 203, 246) as Bearden eliminated G-P. Ramey followed closely with a 674 series, including a 246, to pick up two wins. Zander Pritt and Michael Hines also notched two wins for the Bulldogs. Catholic senior Austin Humphreys outdueled sophomore Peyton Huskey, Sevier County’s No. 1 bowler, with games of 233, 212 and 246 games for a 691 series – tying Whitaker for the top individual performance of the day. Sophomore Lucy Edwards had a 189 game and picked up one win in South-Doyle’s loss to Sevier County. Jasmine Senchal had a 596 series, finishing with a 234 game, to lead William Blount past Bearden. The Lady Governors trailed 12-4 but won five of six matches in Game 3 and also moved ahead in overall pin fall to pull out their one-point win. Bearden junior Kristy Dean had a 578 series and a 211 game in a losing cause.